As the largest city in Massachusetts, Boston is home to many happy residents and booming businesses. Founded in 1630, it is one of the oldest cities in the U.S., making Boston full of historic charm and unique architecture. Boston was named #55 on Forbes’ list of the best places for businesses and careers and was nicknamed the “Athens of America” for its many colleges and universities. Boston is a bustling city with busy workplaces and warehouses involving large equipment. In the effort to keep up with expansion and get into a rewarding career, fast, many residents are choosing to become forklift operators. However, before you can get behind the wheel, you need to look into proper forklift training Boston MA. No matter where you go in the United States or elsewhere in the world, forklift operation is one of those occupations where you can always find work. Just as long as you are trained and certified! The median annual salary for Boston forklift certification is $35,695, compared to a national median of $32,680. While this is a good number, the cost of living in Boston can be high. Most people working in Boston live just outside of the city to save money. No matter where you are in Boston, you won’t find a shortage of jobs involving forklifts. The Quality of Life Index for Boston is acceptable at 189.10, according to Numbeo. Compare this to New York City, with a QOLI of 121.07. Boston ranks well for purchasing power, safety and health care but falls short when it comes to its Consumer Price Index (93.97), Property Price to Income Ratio (4.2), traffic commute time and pollution. Boston has a population density of 12,200 persons per square mile. New York City, by comparison, crams more than twice that many people into the same amount of space. 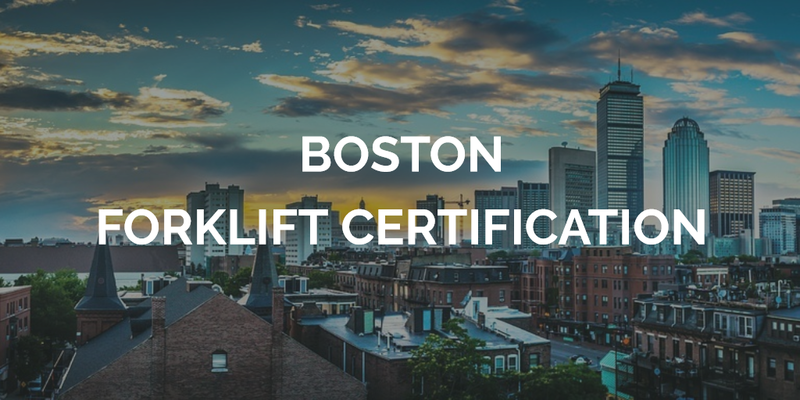 Once you receive your Boston Forklift Certification and forklift license MA, you’ll be at an advantage over other workers who aren’t trained and certified, and will definitely qualify for the best forklifts jobs in the metro Boston area. In December 2015, a man from Brockton, Massachusetts was killed in a forklift accident at a warehouse where he worked, Pharmasol. The man became pinned between a forklift and a large pallet when he attempted to get the pallet down for another employee and backed into a shelving unit. The forklift went under the shelving and pinned the man against it. The man died shortly after arriving at the hospital. It isn’t known if the man had been trained, but such accidents can be prevented with proper certification and preparation for situations like this. Boston forklift certification teaches workers the importance of checking their surroundings before operating an aerial lift. In January of 2016, a serious forklift accident in Massachusetts led to a man needing to be airlifted from his workplace to a hospital in Boston. The victim was injured after the forklift he was operating fell from a 12-foot high platform. It isn’t clear what caused the forklift to fall, but it is possible the worker was distracted or wasn’t following proper safety protocol. According to Boston forklift injury lawyers, forklifts are some of the most hazardous pieces of equipment. They can cause severe injury and fatality to both the operator and those nearby. OSHA requires employers only to hire workers with forklift certification MA to operate machinery. When employees disregard these regulations, they are putting everyone in that worksite at risk. Some of the most common causes of forklift accidents are equipment malfunctioning, improperly maintained equipment, and operating a forklift on uneven terrain. For employees to understand the protocols that come with operating forklifts, and how to assess the equipment, they need to complete training and get their forklift license MA. Boston’s economy packs a fair wallop on the international stage, ranking among the most powerful cities in the world. Manufacturing, construction, trade, transportation and utilities, all big consumers of Boston forklift certification, make up a third of the economy so there is no shortage of jobs for forklift training in Boston. According to Boston.com, the top employers in Boston among the industries that are hungry for people with forklift training Boston MA are Consigli Construction, Christian Book Distributors, Suffolk Construction and Cubist Pharmaceuticals. Is Boston Forklift Certification for You? There is a lot to like about Boston. It has a desirable location on the north Atlantic coast. It is steeped in history; you can feel the presence of our country’s forefathers. Boston hosts teams in all four American professional sports leagues: The New England Patriots (NFL football), Boston Red Sox (NBL baseball), Boston Celtics (NBA basketball) and the Boston Bruins (NHL hockey). So if you like sports, this is a good place to use your Boston forklift training. If you’re not a Sox fan, however, you might want to live and work somewhere else. Music fans will appreciate the Boston Pops, home of the Boston Symphony Orchestra. No longer the preserve of the well-to-do, The Boston Pops Symphony Hall on Massachusetts Avenue is ranked as Boston’s Number One attraction. The second most popular attraction in Boston among people both with and without Boston forklift training is the Museum of Fine Arts on Huntington Avenue in southwest Boston. Boston has something for everybody – a decent quality of life, a great location and plenty of culture and history. If you have kids in school, you can count on them getting a top class education. If you already have forklift training Boston MA, getting Boston forklift certification will help you to get a great job. Once you’ve decided to take the plunge and complete your forklift training and forklift certification MA, it’s time to find the right program. When you start looking, be sure to choose a program that is OSHA-compliant with all safety regulations and rules. Luckily for you, you’ll find that and more at CertifyMe.net. You only need an hour and any device with an internet connection to get your Boston forklift certification. Once you work through the modules at your own pace and pass the quizzes and final test, you’ll have your forklift license MA. Boston is home to many different types of career opportunities, with forklift jobs being one of them. Forklifts require skill and practice before they can be safely operated. Accidents happen every day on worksites, and they can all be prevented with educated and certified workers. CertifyMe.net gives students Boston forklift certification they need to become skilled forklift operators, without requiring them to pay hundreds of dollars or spend time in an offsite facility. Get Started Now By Registering Your Company For Free! *If you are an individual not currently employed by a company use your personal name in the 'Company Name' field. Follow step-by-step instructions to get OSHA compliant! This low-cost program can be completed anytime, anywhere! © 2018 CertifyMe.net. All Rights Reserved.